The mission of Trims Direct is to provide quality, solid hardwood moldings and wood floor accessories to retailers of the flooring industry. 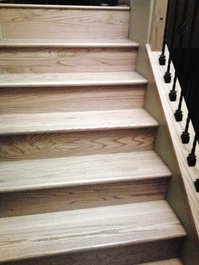 At Trims Direct, we specialize in solid hardwood mouldings, floor transitions, wood vent covers, and stair treads. We are focused on bringing the best possible value to our customers. We offer custom colors and custom lengths, saving you time and money. Our knowledgeable staff will work with you to fine tune any details on the project you're working on. It's simple, free, and fast! Please call for more details and to set up an account. STAIR REMODELING JUST GOT A FEW STEPS EASIER! DELIVERS A SOLID HARDWOOD UPGRADE WITHOUT HAVING TO REBUILD. Click on RetroTread picture and pan down to watch installation videos. Contact us at info@trimsdirect.com to receive wholesale pricing, along with current promotions, or fill out the online company information sheet under the forms tab. We now custom color match!! Click here to view our vast array of colors. Or you can use your Color Selection Sample Set to match to one of our colors. Note: Our colors may vary because our products are made of natural materials.